The Gourmet Coffee Lover's Gift Set is the perfect gift idea for that coffee lover in your life that can't start a day without several cups of coffee. 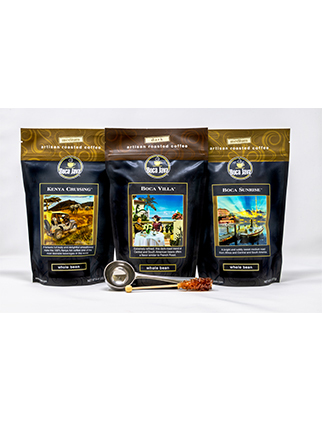 This gourmet Coffee Lover's Gift Set comes with three 8oz bags of roast-to-order coffee a stainless steel coffee bean scoop and rock candy swizzle sticks. The Gourmet Coffee Lovers Gift Set is the perfect coffee gift basket for that person in your life that loves coffee so much they can't start their day without it. If this is your first time purchasing from Boca Java we want you to know why we're different and why that lucky person will love this coffee gift box. Boca Java is a Roast-to-Order gourmet coffee roaster and that means we don't roast a single green bean until after the customer has ordered it. Then, the day after roasting it we ship the coffee to you or the gift recipient. This is a super fresh gourmet experience that cannot be found in a store or almost anywhere else. - One 8oz bag of Boca Sunrise - it's not only our top selling medium roast coffee, but it is also our #1 selling coffee across the entire Boca Java line. Boca Sunrise is a crowd pleasing, medium roast coffee blend. It has a full body with citrus and notes of honey, a sparkling acidity and a very clean finish. - One 8oz bag of Boca Villa - one of our most popular dark roast coffee blends using Arabica coffee beans from Indonesia, Central and South America. This dark roast coffee has an intensely bold and flavorful taste and slight bite of spice on the finish. - A stainless steel coffee bean scoop so the coffee lover in your life can dose out the perfectly proportioned amount of coffee to brew up at home. - A sweet treat of five rock candy swizzle sticks so the lucky coffee lover can be reminded of just how sweet this gift was - the he or she received from you! When you're looking for that unique gift idea and you want to give something more personal than a gift card, this year try giving the gift of gourmet roast-to-order coffee! We promise, we'll make you look good for giving this gift. Beautiful set and delicious coffee. Great gift! The product was a gift and has a nice variety of delicious coffees! Now I have to get one of these gift packs for more people. They are so jealous. I gave a couple of these for Christmas and they met rave reviews. The recipients were delighted and thought it to be some of the best coffee they had ever had.